EDIT: Unfortunately Google took the challenge offline so you can&apos;t play it anymore. Meh. We begin with guesstimating the correct order for colourful balls. This is the easy part, it&apos;s pretty much a Mastermind game, but I didn&apos;t realize it at that time. There is no limit on the number of attempts and you can pretty much brute force it. Each time you attempt to make a guess, you are being given a &apos;hint&apos; or a &apos;score&apos; on how close was your attempt to the actual solution. 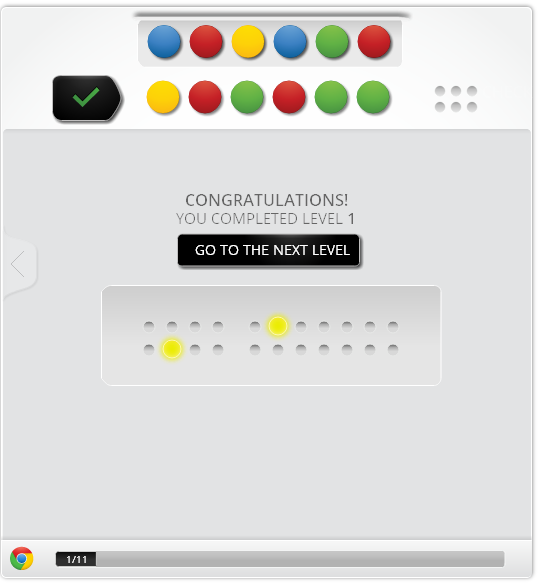 After trying for couple of times you can deduct what&apos;s the meaning of these little black/white/gray bulbs even if you&apos;ve never seen a Mastermind game before. Terminology: What in Mastermind is called code pegs I ignorantly refer to as &apos;balls&apos; within this document. What in Mastermind would be key pegs I simply call &apos;bulbs&apos;. 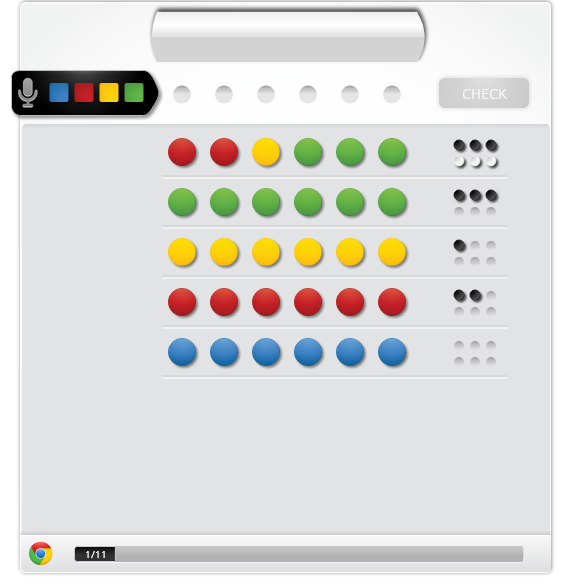 With no more than 4 attempts you can estimate how many times a ball of each color should appear in the final solution. That simplifies the problem to arranging the balls in correct order. I admit I pretty much brute forced the actual correct order and it took me roughly 20 minutes to go through all 11 levels while having the lunch in the office at the same time. Bulbs represent some kind of &apos;meta data&apos; - position, location, placement. Based on these assumptions I&apos;ve tried to come up with some way (an algorithm) to derive a value from the set of 3 balls, usually by mixing and re-calculating their RGB representations in different ways. That didn&apos;t work. The key to the solution is Google logo or its colors. At this point my imagination went quite wild. I&apos;ve tried to perform various calculations on RGB representations of Google logo bulbs and each level&apos;s solution bulbs. I&apos;ve went as far as counting the number of occurrences of each color (blue and red -> 2, green and yellow ->1), converting that to binary and trying to get the answer that way. I&apos;ve gave up after about an hour, finished lunch and get back to office work. If bulbs have different colour, check other bulbs in the secret solution. If there is one with a matching colour in the secret solution (that is not matched correctly in the guessed answer and it has not been used before) the result is white dot [◦], otherwise it&apos;s null . In case where operation 3 results in [◦], mark that bulb in secret solution as &apos;used&apos;. The actual value must be represented by the bulbs. 120 in ascii is lowercase &apos;x&apos;, however if you think about it, most of the combinations of 0, 1 and 2 don&apos;t produce meaningful values in ascii (e.g. 012 would be &apos;vertical tab&apos;). You can&apos;t build a sentence with such a limited vocabulary either. It&apos;s an incorrect approach, let&apos;s try something different. 26? Hold on, isn&apos;t that a total number of letters in english alphabet? Wikipedia! Whenever you&apos;re stuck - stop and assess your knowledge. Write it down as a list, graph or something. If you&apos;re still stuck make an assumption and chase it. Gazing at the problem usually doesn&apos;t help. It&apos;s ok to fail. Learn from it, then discard a non-working solution, revert back to a known state and start again. If you&apos;re stuck for a long time, leave it. Look for something else to do and come back to a problem later on.